“What’s the biggest risk to your financial security in retirement?” Whenever I ask that question, what I hear most often is that people are concerned about whether or not their money will last. Many pre-retirees don’t budget for unexpected medical expenses that can pose a threat to their retirement income plan. The Employee Benefit Research Institute estimates that a couple, both 65, retiring today with median prescription drug expenses needs $151,000 (in today’s dollars) to have a 50 percent chance of meeting their health care costs in retirement, not including long-term care costs. A couple with $255,000 in savings would have a 90 percent chance of covering those costs. In my experience, many pre-retirees mistakenly believe that Medicare, the federal health insurance program for those aged 65 and older, will cover the vast majority of their health care expenses in retirement. Not so. In reality, Medicare doesn’t cover many of the health care expenses older Americans use most. I’m talking about vision and dental care, hearing aids and eyeglasses. And Medicare Part D plans vary widely when it comes to prescription coverage. I remember feeling sticker shock when I helped my mom and stepdad pay their monthly pharmacy bill. Millions of Americans take blood pressure, diabetes, arthritis and other commonly prescribed medications to stay healthy and out of the hospital. These aren’t health care costs you can dial back on to save money. PSM has received the 2015 proposed benefits for two of our top MA-PD carriers. Aetna / Coventry and UnitedHealthcare®. Both companies are offering strong offerings for 2015 with many zero premium areas. Contact us today to make sure you have these companies in your portfolio for the upcoming Enrollment window. 2015 Proposed Medicare Advantage Plan Benefits and Certification Details Now Available. Contact a Marketing Representative today at 800-998-7715. On Oct. 24, 1995, Newt Gingrich made an assertion about what would happen to Medicare if its beneficiaries could choose between it and private plans. Medicare is “going to wither on the vine because we think people are voluntarily going to leave it — voluntarily.” Over the nearly two decades since, Mr. Gingrich’s claim has undergone something of a test — and it has largely passed it. Today, 30 percent of Medicare beneficiaries are enrolled in a Medicare Advantage plan, more than at any time in history. 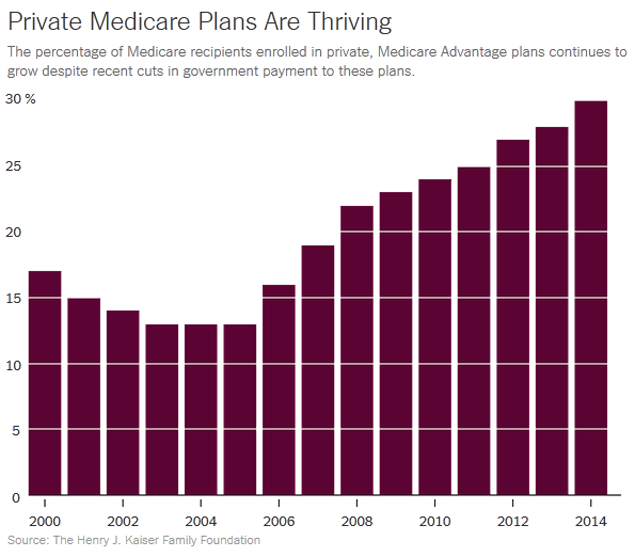 What explains the growing popularity of private Medicare plans? One answer is that baby boomers, who are just entering Medicare-eligibility age, are more accustomed to the types of insurance Medicare Advantage offers, such as H.M.O.s, than their predecessors were. Given a choice between traditional Medicare or more benefits from more highly subsidized private plans, Medicare beneficiaries may well be willing to let the former wither on the vine. In honor of our country and forefathers, we've gathered a few classic patriotic quotes for you to take in during this 4th of July holiday. As a reminder, PSM will be closing Thursday at noon and will be closed all day Friday in observance of the holiday. "Idleness and pride tax with a heavier hand than kings and parliaments. If we can get rid of the former, we may easily bear the latter." "I am well aware of the toil and blood and treasure it will cost us to maintain this declaration, and support and defend these states. Yet through all the gloom I see the rays of ravishing light and glory. I can see that the end is worth all the means. This is our day of deliverance."